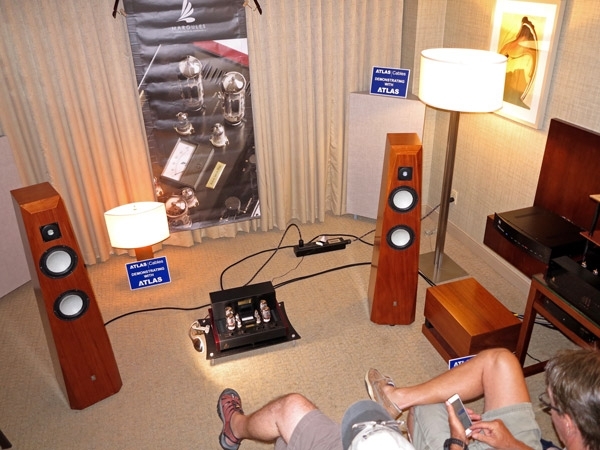 The California Audio Show may have been smaller than in years past, but its proportion of excellent sounding systems6 out of 32 or so, if you count exhibit rooms that had more than one system in playwas quite high. For this reason alone, I believe the show offered great value for attendees. 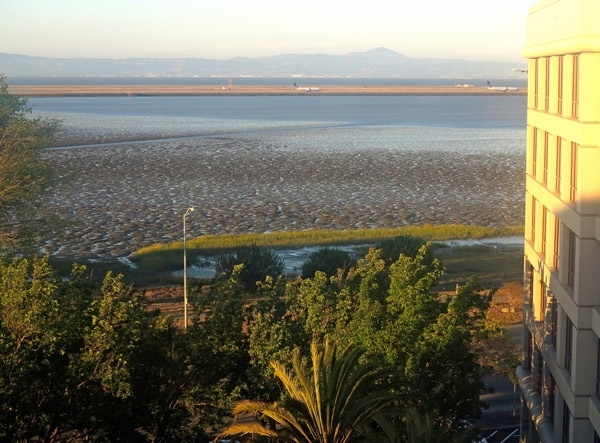 And it also offered some great views of San Francisco International Airport, as this shot, taken through my 7th-story hotel window, attests. Here is the word on show attendance from show organizer, Constantine Soo: The final number is 2300 attendees. It's a rare day when famed amplifier designer Nelson Pass leaves his bench to deliver a seminar. It's even rarer when that seminar is geared toward consumers rather than what he calls "specialists." 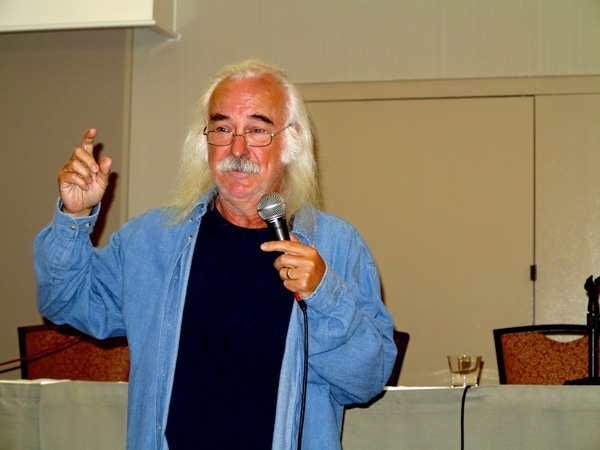 In fact, at the start of his talk, Nelson confessed that after almost 50 years building amplifiers, his CAS seminar was his first ever tailored specifically toward consumers. Yes, boys and girls, there was yet one more distinctly superior system at CAS6. In addition to Bricasti, Elac/Audio Alchemy, and the two systems from AudioVision SF that included a varying combination of Dynaudio/YG Acoustics/Bel Canto Black/Pear Audio/Nordost and more, Michael Woods' Elite Audio Systems of San Francisco Kharma/CH Precision/Viola/Spiral Groove/ Primare/IsoTek and more system blew me away. Adding to his triumph is the fact that, on Thursday evening, a frustrated Michael (pictured on the right next to Kevin Wolff of Vana Ltd. and, on the left, Allen Perkins of Spiral Groove) had told me that he was having a near-impossible time controlling the room. How to explain this one? At other shows, the most problematic rooms for an exhibitor to control are usually the large rooms on the ground level, where a combination of air walls, air-conditioning ducts, wall composition, and secrets pacts between the Devil and the Deep Blue Sea (which, in this case, was literally across the street from the Westin SFO) can defeat any and all attempts at good sound. 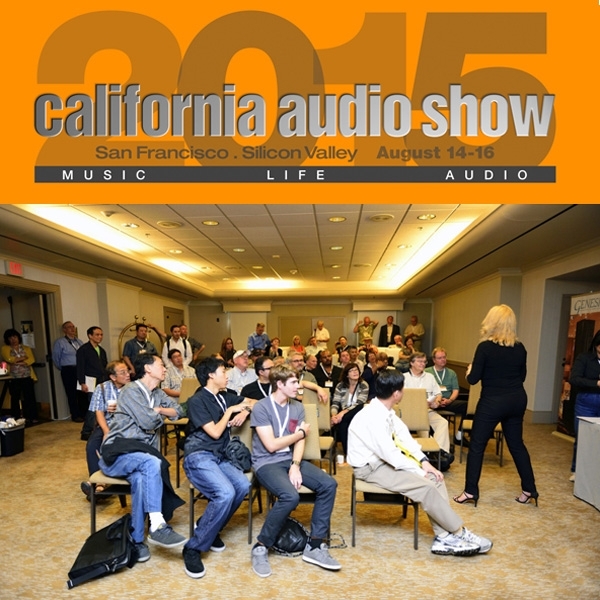 But at both the California Audio Show and the last T.H.E. Show Newport Beach, most of the big rooms on the ground floor produced excellent sound. 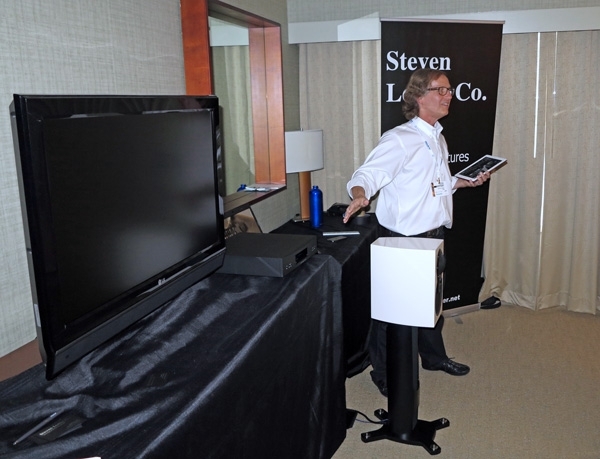 Sunday, for Stereophile, began in the larger rooms on the 2nd floor of the Westin SFO. 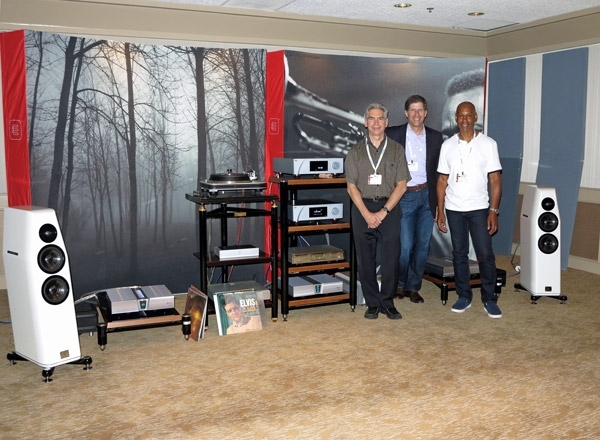 In the first I visited, Pass Labs mated its INT-60 integrated amplifier ($9000) and XP-15 phono preamp ($3800) with an SP10 Mk.II turntable fitted with a My Sonic Lab Hyper Eminent cartridge, Oppo BDP-105, YG Carmel 2 loudspeakers ($26,300/pair), and a mixture of ART, Sound Source, homemade, and stock power cables. 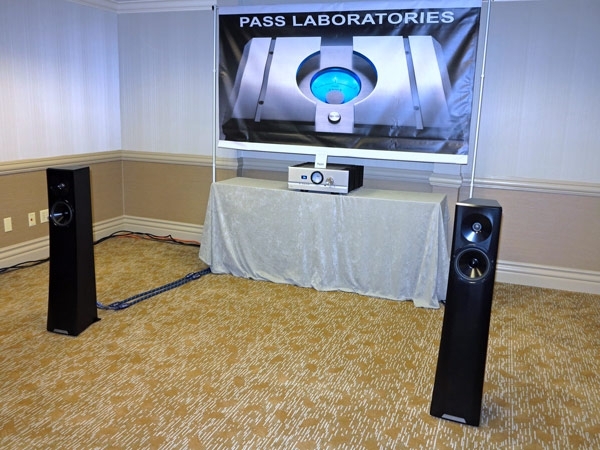 Pass Labs' signature midrange was gorgeous, and the sense of air supreme. I wish I could tell you about the Linn system in this room, but both times I tried to enter, Steven Lester was in the middle of a long rap. Lester's video components always provide some of the most fun and unexpected treats at a show, and usually result in packed rooms. That was certainly the case the first time I came by. 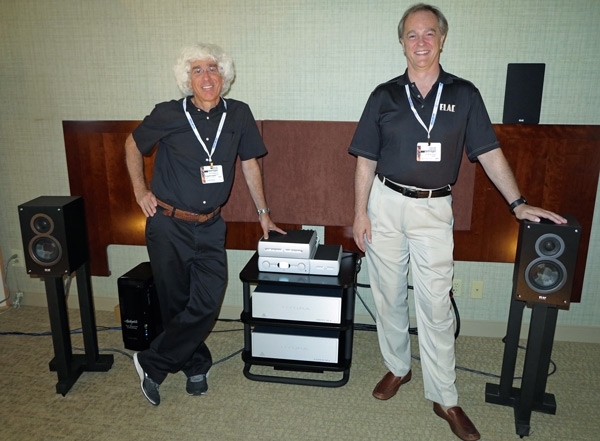 Mexico's most distinguished audio manufacturer, Margules Audio, demmed a system at CAS6 headlined by the Margules U280-SC 25th-Anniversary, stereo tube amplifier ($5399). The midrange was warm and wonderfuljust what the doctor ordered, in fact. Despite a little brightness on top, and a bit of shallowness on bottom, the set-up was supremely musical and capable of conveying joyful, delicate beauty with panache. That, my friends, means a whole lot in my book. One of the highlights of Day One at CAS was the room put together by Bricasti. The opening track in Brian Zolner of Bricasti's sensational salvo may have been drawn from, God help us, the soundtrack to Alien 3, but the midrange was gorgeous, and the dynamic range immense. Simply immense. 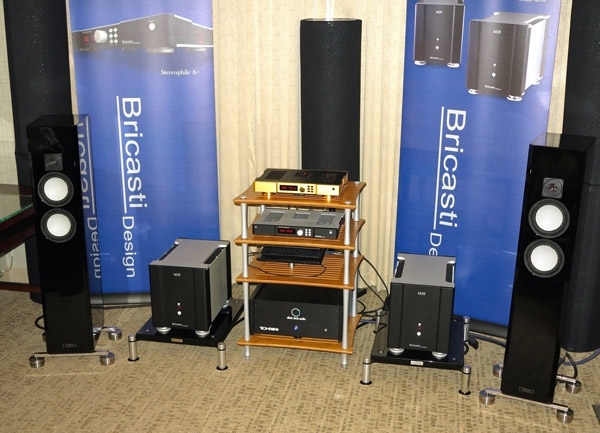 This Bricasti and friends system exhibited the largest dynamic range sweeps of any system I recall hearing in a standard-size hotel room. 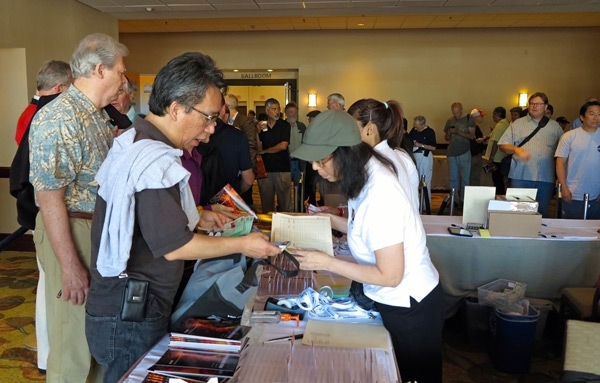 On paper, the 6th annual California Audio Show, taking place this weekend at the Westin SFO in Millbrae, CA just south of San Francisco, qualifies as the smallest consumer audio show in the United States. But you wouldn't have known it from the lines at the registration table at 10:30am on opening day. The place looked packed. And the reality was, given 29 active exhibit rooms, some with multiple systems, plus other active exhibits in the lobby, Friday's turnout felt perfect.